Desperate to eject some refugees it does not want, the Netherlands is refining the art of radical deprivation. No single step, no single decision, no single action in this process is horrible. Yet the cumulative effect is grotesque. 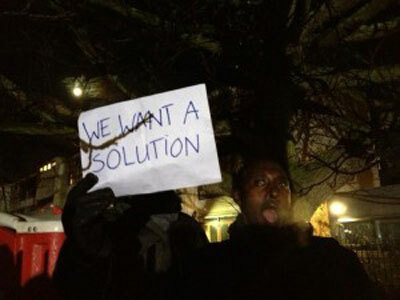 Some months ago, a group of refugees from East Africa and the Middle East protested loudly against the Dutch state’s refusal to grant them legal residency despite the fact that they are stateless. They set up a tent camp outside the asylum centre where they had been rejected. They asserted that this was a political statement, not a request for humanitarian hand-outs. They refused to be helpless and needy; what they wanted was the possibility of caring for themselves and a solution to the inhumane treatment of stateless refugees in the Netherlands. Very simply: for themselves and for others, they wanted the right to work and to build a life. The Dutch state did not like this. Quickly it colluded with the asylum centre. Under pressure from national politicians, the city authorities had the police shut down the camp and evict its occupants summarily. This was an utterly illegal violation of Dutch laws governing the right to protest. Just to make sure the city would not have to break the law again, the asylum centre put up a big fence around the terrain to make it impossible for anyone to protest there again. This was shocking since, unlike many other states, the Dutch state is rarely blatant about breaking its own laws. But “the problem” did not go away. Instead it became more visible. The refugees split into two groups. One group set up a tent camp in Amsterdam; the other in The Hague. Most of those in The Hague were Iraqis who did not want to return to Iraq. The state of Iraq, in turn, refuses to recognize or accept citizens who do not want to return voluntarily. So now the Iraqis are stateless. In Amsterdam, the largest national group are some fifty-odd Somalis whom the Somali embassy refuses to recognize as citizens despite pressure from the Dutch government. So these refugees too are utterly unable to live or travel anywhere because they lack papers. Other people in the camps are from Ethiopia, Eritrea, Iran, Afghanistan and Azerbaijan. It is miraculous that the camp in Amsterdam came into being. Divided by years of war, conflict and distrust, the Somalis, Ethiopians and Eritreans should not be able to work together. But they have. Under incredible pressure, with no shared history and no shared structure, only shared statelessness. Anyone who has ever lived or worked in a collective will know just how difficult it is for complete strangers to invent ways for living and working together; made exponentially more difficult by never knowing what the next day would bring. How would they survive? If they had food, would they have a place to lay down that was dry? What would the consequences of their decisions be? I write this very literally and coolly. A country that is not only one of the richest in the world, that for years also appeared to be one of the most humane, is now systematically reducing a group of people in its midst to living at the most bare, primitive and psychologically exhausting level possible. The Dutch state is wilfully and meticulously setting out to make the lives of the refugees so miserable that they will start to think and feel that whatever happens, any other country must be better than the Netherlands. Obsessed with being “strong” on immigration as a desperate attempt to reconnect with voters, the Dutch government is refining the art of non-violent torture against stateless refugees. No single step, no single decision, no single action in this process is horrible. Yet the cumulative effect is grotesque. Until 1905, China practiced a form of execution called Death by a Thousand Cuts. It was just what it said: a slow, punishing, humiliating death by slicing off parts of a living body tied in place, until finally, life abandoned it. What we are seeing here, is the bureaucratic, refined, twenty-first century version. All blood and gore is gone, the slicing is purely psychological and social. Cutting off the asylum seekers bit by bit from every possible social connection and psychological security, until they despair and in a desperate attempt to preserve themselves, leave for elsewhere. A few days ago, the camp in Amsterdam was razed. First the human chain of protestors outside the fence had to be broken. Mounted police on huge horses moving in. Then more than a hundred refugees were taken out, one by one, finger-printed, arrested, put on a bus. 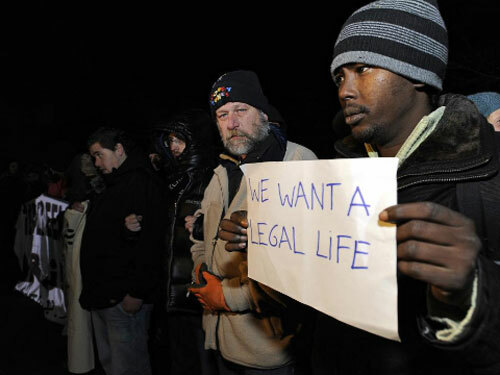 Some of the refugees held signs: “we want a normal life.” Others, not able to speak Dutch or English, taped their mouths shut and stood as witnesses until they were taken away too. It took hours. The police started at seven in the morning, when it was still dark and quiet. The routine of walking out the refugee and booking him, repeated over and over until it was a ritual, an ode to the rational, bureaucratic state. By the time the police were done, it was light, the neighbours watching them, the children going to school watching, all the local and national TV cameras watching. Until the buses pulled away, no one knew where they would go, or what would happen to the refugees. Men in white suits crawled all over the empty terrain, disinfecting it of the foreign presence. The police separated the groups by nationality. At the end of the day, all the Somalis were dumped back on the street, without even knowing where they were or where the others were. When they asked the police where should they go, the police shrugged their shoulders. As before, the message to the refugees was clear: the Dutch government couldn’t care less, as long as they became invisible, disappeared, ceased to trouble this country with their very existence. The fact that this breaks European Human Rights conventions is of no interest to the government. What is of more interest – and a greater threat – is the public support the camp has been getting from lawyers, neighbours, activists and the media. The night I was there, leading up to the camp’s destruction, three young Turkish-Dutch women showed up suddenly in the dark with huge platters of spicy chicken, vegetables and rice for everyone. They put it on the concrete ping pong table that was the collective dining room, laughed a bit in the cold rain, then left again as suddenly as they came. A Moroccan neighbour went to get bags of paper plates, utensils, and napkins when he figured out there was nothing with which to eat the food; while an old man, expert in being homeless, rollerbladed around us, guitar on his back, tapping his bag, telling me he had fire in there for the night. Later, when he lit a small fire in a pan, as he’s done for years, the police came through the gate into the camp, and forced them to pour water on it. The steam from the dead fire and the rain made everyone wetter, colder, and more alone again. Young students came; dreadlocked activists; a few feisty middle-aged Dutch women from working class neighbourhoods; and a handful of asylum seekers from other cities. An Iranian with whom I talked about Iranian feminism, while others listened and jumped in now and then, some holding their hands over a platter of candles in the smoky tent, chewing khat, sipping cheap beer, many quiet. Still, the support is anything but dramatic: the protest marches organized in the last weeks on behalf of the refugees never garnered more than a few hundred people. The only political party interested in them were the local (International) Socialists. Yet still. It is today the only visible public protest against the Netherlands’ cruelty to refugees. “Cruelty” is the correct word and not a dramatization. Both the national Dutch ombudsman and the CPT (the European Committee for the Prevention of Torture and Inhuman or Degrading Treatment or Punishment) have found that Dutch treatment of asylum seekers without papers inhumane. As the Dutch legal journalist Folkert Jensma has argued, the moment they enter the system, they enter what is effectively a prison. They are locked into a small room for sixteen hours a day; have extremely limited access to telephones, internet and visitation rights; are regularly patted down and inspected; and are kept behind barbed wire. Handcuffs are used widely and disproportionately, while medical care is substandard. Those who go on hunger strikes are put into isolation cells to break their will. None have any possibility to work or to educate themselves. While countries such as Sweden, Australia and the UK allow such stateless asylum seekers to move freely within buildings and have room for sports, recreation and work, none of this is to be found in Dutch centres. Their only purpose is hold and to punish those who have come without papers for their audacity. Like the men in Guantanamo – but without the orange suits and macho military – they are punished without being convicted. Lacking papers and the protection of a state, the refugees are at the mercy of a Dutch state that feels free to abandon the rule of law and make of every centre for unwanted aliens a little Guantanamo. Any visible protest – particularly protest whose intent explicitly is to challenge the system rather than to accept a handout from the state – is then deeply threatening whatever its size. This is the only way to understand the Dutch state’s idiotic, disproportional and ostentatiously callous response to the refugees. The mayor of Amsterdam has been saying that “now it has to stop.” He did not mean the state breaking the law; he meant the refugees creating an irritant he could not ignore. The case was put to a judge, who visited the camp personally, then decided that there was too much chance it would attract vermin and was too disruptive for the neighbours (ignoring the extensive support from the neighborhood) and therefore could legally be evicted. This is what is so deceptive to those watching from the outside. There is hardly any spectacle: no gangs of racist skinheads storming the camp; no police violence; no militarized attacks. The violence for which we are used to looking, that we see in so many other places, will not be there. This is the violence of the rational sadist state at a loss for how to use its power. The state is afraid, because the strangers are raising issues it does not dare to face: should asylum seekers have the right to influence the policies by which they are judged? Are refugees “human” from the moment they enter Europe? Or are they to be “nothing” unless and until they have the good luck to become residents and citizens? This tells the story in Amsterdam. But right now all over Europe – in Vienna, in Hungary, in Berlin – there are the same protest camps, the same refugees, the same overbearing states and clusters of local protest. Small, scattered and disparate as they are, they raise a fundamental question that Europe does not know how to face any better than the economic crisis: do we dare to be humane, even at the cost of being just a little less rich, a little less a fortress, and a little more just? Where has the rational and balanced “netizen” gone?